Bill Gates and Steve Jobs came together 21 years ago, when Microsoft agreed to invest $150 million in Apple stock. The deal shocked Apple purists, but it helped put Apple on a firm footing for a few reasons —and made its historic run possible in the second Steve Jobs era. In August of 1997, Steve Jobs had just become Apple's de facto interim CEO, following the ouster of previous CEO Gil Amelio. Jobs acted quickly with a series of moves, including cancelling the Newton, Cyberdog, and other product lines developed during his exile from the company. But Jobs' next move was even more bold and shocking. In an effort to bring the company into financial solvency, Jobs did the unthinkable: He made a deal with Bill Gates and Microsoft. Apple and Microsoft are both pioneering technology companies, founded around the same time. And, both were long associated with charismatic co-founders — Steve Jobs and Bill Gates — who redefined what it meant to serve as the face of a technology company. In their early years, Apple and Microsoft's missions were somewhat different, with Apple making computers and Microsoft more focused on software. But there was enough overlap between them that it set off something of a culture war in computer culture that lasted for most of the 1980s and 1990s. There were, as there continue to be today, "Mac people" and "PC people," who had diametrically opposed notions of what computing and user experiences were supposed to be. They fought with advertising, and they fought in court. Apple Computer, Inc. v. Microsoft Corporation was a copyright infringement suit, first filed by Apple in 1988. Apple argued that Microsoft had used elements of the Mac GUI in its Windows operating system, beyond the parts licensed by Microsoft from Apple at the time of Windows 1.0 in 1985. Both a district court and appeals court decided in Microsoft's favor, although the case remained alive on appeal until 1998. In 1997, Steve Jobs was back on top at Apple, but the company was in major financial trouble. It was a moment that required a bold move. The talks between the companies for Microsoft to invest in Apple had actually begun before Gil Amelio's ouster, as Gates and Jobs discussed in their famous D5 conference interview in May of 2007. Jobs called Gates following Amelio's departure and told him "don't worry about that negotiation with Gil Amelio. You can just talk to me now." "Well, a lot of people's heads were in that place at Apple and even in the customer base because, you know, Apple had invented a lot of this stuff and Microsoft was being successful and Apple wasn't and there was jealousy and this and that," Jobs said in the D5 interview. "There was just a lot of reasons for it that don't matter but the net result of it was, was there were too many people at Apple and in the Apple ecosystem playing the game of, for Apple to win, Microsoft has to lose. And it was clear that you didn't have to play that game because Apple wasn't going to beat Microsoft. Apple didn't have to beat Microsoft. Apple had to remember who Apple was because they'd forgotten who Apple was." So the deal was struck. Microsoft agreed to invest $150 million in Apple stock. The companies agreed to settle all outstanding litigation and cross-license patents, while making Microsoft Office available for the Macintosh, and making the Internet Explorer the default browser — but not the only one — on the Mac. As Time magazine famously put on its cover, Jobs said to Gates, "thank you, Bill. The world is a better place." The deal was announced at Macworld 1997, which marked Jobs' first major event as interim CEO, where he would lay out his plan to rescue the company from the brink of bankruptcy. "Apple lives in an ecosystem and it needs help from other partners, it needs to help other partners," said Jobs on stage. "And, relationships that are destructive don't help anybody, in this industry as it is today. "In the last several weeks we've been looking at some of the relationships, and one has stood out as a relationship that hasn't been going so well, but has the potential, I think, to be great for both companies," Jobs added. "And I'd like to announce one of our first partnerships today, a very meaningful one, and that is one with Microsoft." The immediate response was mixed, as you might expect. 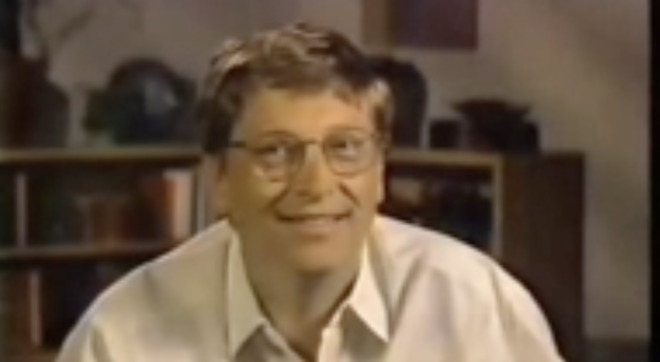 "Some of the most exciting work that I've done in my career is work I've done with Steve on the Macintosh," said Gates. "Whether it's the first introduction or doing products like Mac Excel, these have been major milestones, and it's very exciting to renew our commitment to the Macintosh." The media reaction was significant. There was that famous Time cover, of course. Meanwhile, the New York Times editorial page weighed in as well. "Some Apple zealots in the audience hooted. Others sighed in relief," the unsigned editorial said regarding the Macworld announcement. "Virtually all were surprised and confused. Even in cyberspace it is odd for one company to bail out its only rival in a key area of business. Between them, Microsoft and Apple sell the operating systems, which dictate how computers analyze and display information, that run virtually every personal computer. Odd or not, the bailout is good for both." The agreement with Microsoft may have come at a time of great desperation for Apple, but it worked out quite well for the company. The investment was a stock purchase, and didn't directly put money into the hands of Apple. But, it did act to stablilize Apple's stock. At the time, the company's stock was trading at 86 cents a share adjusted for dividends and the three splits since then. It truly took off in 1999, once it became clear that Apple was truly back. More importantly, perhaps, was Gates' promise to continue delivering Microsoft Office products for the Mac going forward. Along with the stock, Apple's financial position soon stabilized, with the original iMac arriving the following year as Apple's most successful new product in years. And, any betrayal that Apple partisans felt about the embrace of Bill Gates failed to have any lingering effects. And then came the iPod, the iPhone, the iPad, and Apple's emergence as the most valuable brand in the world. As for Microsoft, it helped their standing as it assisted a competitor, at a time when the company was being sued by the government for its supposedly monopolistic practices. Sure, Apple and Microsoft maintained separate cultures that often opposed each other, and the two companies continued to do battle over the airwaves, most notably with Apple's "Get a Mac" campaign that ran from 2006 to 2009. As for that $150 million investment, Microsoft sold that stock back to Apple by 2003 as per the arrangement the pair had struck. As of May 2014, according to Engadget, Microsoft's Apple stake would have been valued at $21.86 billion, had they held it. That means Microsoft's $150 million Apple investment, had they kept it, would now be worth about $52.6 billion. When the two men sat for that D5 conference interview in 2007, the first question from interviewer Kara Swisher was to ask each of them to say what the other had contributed to the computer industry. "Bill built the first software company in the industry and I think he built the first software company before anybody really in our industry knew what a software company was, except for these guys," Jobs said. "And that was huge. That was really huge. And the business model that they ended up pursuing turned out to be the one that worked really well, you know, for the industry." "What Steve's done is quite phenomenal, and if you look back to 1977, that Apple II computer, the idea that it would be a mass-market machine, you know, the bet that was made there by Apple uniquely," Gates said. "There were other people with products, but the idea that this could be an incredible empowering phenomenon, Apple pursued that dream." In the years following the deal, the relationship between Jobs and Gates took on the air of former rivals who would occasionally appear together to talk about the good old days, the way Bill Russell and Wilt Chamberlain might have about basketball. Gates stepped down as CEO of Microsoft in 2000. In 2006 he began stepping away from the company in order to devote more of his energies to his philanthropic efforts. Jobs, of course, remained CEO of Apple until he resigned for health reasons in August of 2011. He passed away two months later. In an interview with The Daily Telegraph in 2012, Gates talked about his relationship with Jobs, revealing that he had paid a lengthy visit to Jobs not long before his death. "We spent literally hours reminiscing and talking about the future," Gates said. He later wrote Jobs a letter, in which "I told Steve about how he should feel great about what he had done and the company he had built. I wrote about his kids, whom I had got to know. "There was no peace to make," added Gates. "We were not at war. We made great products, and competition was always a positive thing. There was no [cause for] forgiveness." In the 21 years since that August day, Apple has skyrocketed, in terms of shareholder value, cultural cachet, technological importance, and brand equity. The reasons for that are complex and due to a wide variety of factors. But had that deal with Microsoft not been struck in 1997 and Apple had gone bankrupt, there's a good chance none of that may have come to pass.